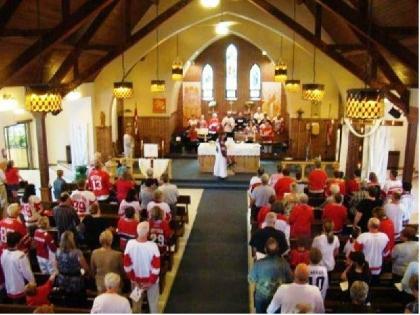 Pictured above: Hockey Jersey Sunday: a fun Sunday where the members of the congregation wear the jersey of their favourite hockey teams to church. Pictured above: The crucifixion and last supper stained glass windows at St. Mark's. These events in Jesus' life form the core of our life in worship and fellowship at St. Mark's just as they form the core of the gospel written by the saint after whom this church is named. You are invited to join us for worship any Sunday in the year. St. Mark's is wheelchair accessible. We will welcome you at the door or our welcome desk and provide you with a bulletin, which will help to guide you through the service and any other information you may need or desire. Sunday at 8:00 am An intimate communion service with bible readings, a sermon, and prayers in traditional language from the Book of Alternative Services, our regular prayer book. The service runs about 45 minutes. Sunday at 10:30 am A beautiful, musical service. There are hymns, other music, a full choir, bible readings, a sermon, and prayers from the Book of Alternative Services. Children may stay in church or attend Sunday School which takes place during the service and ends in time for the children to receive communion. The service runs about an hour and a quarter. Wednesday at 10:30 A midweek opportunity to turn back to God and recharge your spiritual batteries. There are bible readings, a sermon, and prayers from the Book of Alternative services. The service runs about 30 - 45 minutes. Baptisms The sacrament of baptism is celebrated during our regular Sunday worship. The celebration of Holy Baptism adds only a few minutes extra to the regular Sunday service. This service is a wonderful celebration for the whole parish as we welcome a new member of God's family into our midst whether they be a child or an adult. To schedule a baptism please speak to the Rector. Please see our baptism package for more information. To arrange for a baptism please speak to the Rector after church on any Sunday. Marriages The celebration of Holy Matrimony is usually celebrated on Saturdays but can be scheduled for other days except for Sundays. Weddings may not occur during the church seasons of Advent or Lent. Weddings are conducted in the Church with music played by the organist. The service used will come from either The Book of Common Prayer or The Book of Alternative Services and the vows used must be the vows that appear in one of those books. The service will include readings and prayers with the option of Holy Communion. The service runs anywhere from 30 minutes to one hour depending on the music that is chosen and whether Holy Communion is celebrated. Please see our wedding brochure and speak to the Rector following a Sunday servicefor more information. Funerals St. Mark's is honoured to provide a funeral for your loved one. Funerals are scheduled in consultation with the family and the Funeral Home and may take place either in the church or in a funeral home. The basic format of the service will come from one of the authorised books of the Anglican Church of Canada, with bible readings chosen in consultation with the family.